The search for a design for Helsinki’s new Guggenheim Museum is well under way. 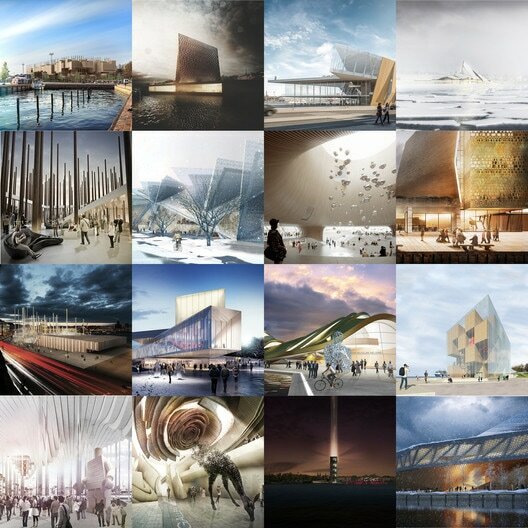 Over a thousand entrants submitted anonymous proposals for the harbor-side museum, and though six finalists have now been chosen, the incredible wealth of talent and effort present in the submissions is hard to ignore. We celebrate that talent here, showcasing 32 great designs-that-could-have-been for the Helsinki Guggenheim. The ground floor is also designed with that thought in mind. Completely transparent, the ground floor has no walls. Exhibition space is framed by the undulations of the floor above, as well as the art itself. These same undulations hide the art from view at different viewpoints, creating an air of mystery that is meant to invite visitors deeper into the space. The transparency of the ground is meant to have a similar effect on passersby. The lack of bounding walls creates the feeling that the museum is more of a public gathering space, rather than a private institution. In many cases, the ground floor could be used for public events such as concerts and galas. Named for its ship-like structure, this design splits its envelope between counterpointing materials: a wooden façade facing the sea, and a copper façade facing the city. Both of these materials are commonly used in Finnish construction, and both act as a brise-soleil. The exposed Finnish Larch ribs of the seaside envelope are spaced for maximum access to indirect sunlight, while the perforations of the copper side of the building do the same. The uncommon appearance of the exterior would make WVA’s design a landmark of the city, and a major site for pedestrian traffic. To accommodate this, the architects planned for widened sidewalks and bike paths, as well as a footbridge over the adjacent roadway, connecting the museum to the nearby park. The Ark is set on a podium that holds conference rooms and other administrative functions for the building. Upon entering, visitors find that the gallery levels are terraced back from the sea, allowing for uninterrupted views of the ocean and the Helsinki skyline. A restaurant on the rooftop museum would give a similar, if not more spectacular panoramic view of the surrounding city. This team proposal from LPzR and Principioattivo architecture group is a dramatic structure that mimics the waves of the harbor water, while at the same time preserving views of the surrounding cityscape. The seemingly amorphous “waves” of the building are lower to the ground at the north end to prevent shading the museum’s entrance plaza, and to protect views of the nearby Palace Hotel. The middle of the building is also sloped so that visitors to the Tähtitorninvuoren Park across the street can see across the harbor. The curvilinear gallery spaces of the museum are designed to be flexible, with exhibition rooms being combined or divided as necessary. The wave structure of the building allows these spaces to be cooled via stack effect when necessary. Possibly one of the most visually distinct designs submitted, Gorgona’s museum takes inspiration from sea waves, the rising and setting sun, and other natural features of coastalFinland. The base of the building serves as gallery and retail space, while the observatory wheel gives guests a bird’s-eye view of the museum’s historical surroundings. A sky bar is placed near the top of the wheel where patrons may stop for refreshment. Additional space for exhibitions and public events is situated on the rooftop of the museum, where visitors may walk directly underneath the arch of the observatory. The natural ceramic and wood finishing of the building’s curvilinear form is meant to provide a pleasant contrast, as well as create a weather resistant and energy efficient exterior. Photovoltaic panels on the roof, rainwater retention, and passive ventilation will also be employed to improve that efficiency. The Sampo’s roof is planted with a small forest of birch trees, which can (selectively) be used to provide materials for artists wishing to work in that medium. The construction of the building itself will also be made out of wood, specifically cross-laminated timber. Lathed, whole-tree posts will be the load-bearing columns for the building’s walls. Seven concrete “super-columns” will support the roof, as well as house collection tanks for rain and snow water. They will also act as light wells and stack vents for the galleries. All of these decisions are aimed at creating a high efficiency design with low embodied energy, while at the same time combining ancient and modern construction techniques. Many proposals in the Guggenheim competition chose to incorporate wooden poles into their design, but none in quite the way that Yong Ju Lee (in collaboration with Sunghyun Park and Kibum Park) has in his design, Imperceptible Figure. Instead of raising the gallery space up on the wooden columns, the architects have chosen to keep the building low to the ground, with the poles forming an almost sculptural display above the roofline. Yong describes this decision as a way for the building to “melt into the background while keeping its strong visual impact.” Embedded with LEDs, these same poles receive weather data from Helsinki meteorological reports, and create a light show that changes with fluctuations in temperature, wind speed, and other events. They are also used to ventilate the museum. The poles are part of a larger Finnish birch space frame that holds the entire building together. Visitors can enter the central lobby from the street, the nearby market, or the waterfront. Around this space, the galleries are “captured and packed in rectilinear rigid mass,” contrasting the building’s curvilinear appearance. The undulating skin of the building is in fact a double skin, with an insulating air cavity between the two layers to protect the building from the harsh Finnish winter. The skin is punctuated by generous windows that give the building light and solar heat. Office One’s proposal is a group of two buildings, a “bar” and a “tower.” The bar, which holds the museum’s private and administrative functions, takes the form of a parallelogram sunken into the ground. The shape of the building is based off existing site boundaries, and is orientated to face the northern half of the site while maintaining a view of the harbor. The top of the bar acts as an extension of the adjacent Tähtitorninvuoren Park, with a sloped green roof that can be used for outdoor exhibitions. The two are connected via a footbridge. The tower is the public space of the proposal, and holds the museum’s galleries. It is conceived as a glass box with a flexible wooden core. This core is composed of open and closed exhibition spaces, creating a checkered pattern that, according to the architects, will “emphasize the relationships and links established among those spaces.” The rooms within the core have movable partitions that allow curators to expand and rearrange gallery space to best fit the art being displayed. The rooms are also designed with white-washed walls and glass ceilings, providing a neutral canvas and excellent light for exhibited work. This proposal by Society Particular is defined by the city grid of Helsinki itself. The museum is set on a plinth that aligns with the harbor and the city blocks along the waterfront. The museum’s boardwalk structure, which connects to Tähtitorninvuoren Park and the sidewalk to the plinth roof, is aligned with the north-south axis extended from the city center. The gallery rooms are positioned over both of these constructs, marking the intersection of these two grids. Visitors enter via a wooden ramp that takes them directly beneath the gallery space. From here they may choose to enter the plinth, which holds restaurants, shops and other public venues, or they can ascend into the galleries themselves. The exhibition space is four levels held in two space-frame construction boxes. With no columns necessary for support, these spaces are highly flexible, capable of hosting everything from small exhibitions to dance performances. What results is a series of “islands” on the site, each an outdoor gallery for the display of art. The largest of these islands becomes the museum proper. From the exterior, the structure gives the impression that it is a cliff face, eroded by the sea at the bottom where visitors enter. Inside, light wells punctuate the volume, providing light to the central lobby as well as the offices and gallery spaces above. Like other entries, Schauman and Nordgren elevate their building on a plinth to signify its civic importance, and to create space for the museum’s service systems. Wild and unruly on the exterior, Logica Arquitectos’ Guggenheim proposal is carefully orchestrated to respond to its surroundings. Designed using a modular shape that has been warped and offset across the length of the building, the structure is streamlined to bear the brunt of the ocean winds coming in off the harbor. This streamlining also gives it the appearance of harbor waves, or a caricature of the Helsinki skyline. Inside, visitors are directed through a series of gallery spaces arranged along the length of the building. These terminate at the southern end of the building, closest to the sea. The offset of the building’s modular arches creates windows and clerestories that bring in plenty of indirect light, and add a level of spatial complexity to the galleries that is pleasing to the eye. The Ice Floe is exactly what its name implies. This sculptural mass by da architecture, is meant to appear as a massive chunk of ice washed ashore from the harbor. The white exterior is actually fiber cement. The cast, diamond-shape panels are removed in places to allow light to diffuse into the gallery space, while adding dynamism to the exterior. This crisp, clean façade is meant to contrast the rough-cast concrete plinth on which the museum sits. Visitors climb up this plinth via the north-facing stairway and enter the building between the opposing elements. Inside, gallery space is wound in a spiral around a central core, much like Frank Lloyd Wright’s Guggenheim in New York. Visitors circulate through the gallery spaces until they reach the top floor, where they may descend a staircase down to the lobby, taking in views of the harbor as they go. Much of the interior is paneled in wood, meant to create a warm atmosphere that belies the museum’s outside appearance. This structural display is set in an open park that allows visitors to wander through it on their way to the various outdoor exhibitions, performance spaces, and cafes on the site. Both the service quarters and gallery spaces of the museum are embedded into the western part of the grid. These spaces weight this cloud-like element to the ground and, in turn, their presence is diffused by the grid. The gallery space itself is three levels, each accessed by a central stairway. Generous harbor-facing windows along these three levels give visitors fantastic views of the city and harbor as they circulate among the art. While many of the submitted Guggenheim designs treat the museum as one building, this proposal from Reddymade Design separates building functions into five distinct masses that hold different programmatic functions. Arranged along the length of the site, visitors circulate through each building via their intersections, allowing them to experience individual parts of the building program separately. The scale and exterior visual style of each of the museum’s parts is meant to mirror the architectural diversity of urban Helsinki. Bronze coated windows, facing east and west, capture solar heat and light throughout the day. The large thermal mass of the building, as well as a heat exchanger, helps in retaining this heat. While the double-skin membrane of the building would be glass, steel, and granite paneling, wood would be used for interior structure and finishing, to create a contrastingly warm atmosphere. The architects at TheeAe wanted to express the natural beauty inherent in the change of seasons: “In every season, there is respective beauty. Especially, the strongest impression tends to happen when there is a dramatic change… In this regard, we propose a new building on the site to continue to bring this excitement.” To that end, they have proposed a museum whose form resembles melting ice floes in the Baltic Sea. The three story building will match the height of the existing skyline as seen from across the harbor, and its site will be planted with an abundance of native trees. In this way, the museum will seem a natural and organic extension of both the park and harbor it abuts. If the Etelasatama harbor area is Helsinki’s gateway, then the Museo Majakka by Atelier V would be its gatekeeper. Modeled after a majakat (Finnish for light house), most of the building’s mass takes the form of a tower at the north end of the site. This tower holds the galleries and museum offices while the rest of the building, which appears as an elevated plaza and garden, holds dining, maintenance, and service spaces. The tower, which is sheathed in glass, holds four wood-clad gallery spaces. Stacked between these are offices, archival rooms, and “sky winter gardens,” which serve as miniature lobby spaces between galleries. All of these spaces are accessed by a ramp that circulates all the way to the top of the tower. The glass skin of the Museo Majakka not only allows light into the galleries, but becomes a kind of digital canvas at night, being used for projections and visual displays. Projekt Praga’s design for the Guggenheim Helsinki focuses on making the museum a public space for the community. Much of the site is taken up by a civic plaza, under which the museum’s lobby and service spaces are located. Unlike many other plaza designs submitted in this competition, Project Praga’s will not be a park-like setting: “The plot stays paved, with a few green exceptions, because it belongs to the urbanized waterfront zone and it is adjacent to the park. This keeps urban structure clean.” Ramps from the plaza lead directly down into the lobby, creating a fluid transition between the exterior and interior. The flatness of the plaza is contrasted by the three-story gallery block that sits at the northern end of the site. The private, inaccessible appearance of the block also contrasts with the very public nature of the rest of the museum. The design of the façade is inspired from Finnish fencing, which adds to the galleries’ visual impermeability. Traditional Finnish architecture is incorporated elsewhere in the building—the rooftop restaurant is a gabled roof structures similar to historical Finnish housing. The rooftop is also home to a public garden space that can be used for exhibitions. To keep their proposal in scale with its urban context, firm ArchitectureRED has based their Guggenheim Helsinki design off of a typical Helsinki street block. However, where most of these city blocks appear as a solid mass with a courtyard void in their center, this proposal will be a mass surrounded by void. What results is a kind of artificial forest of columns, with the body of the museum suspended in the trees. The arrangement of the columns, according to the architects, “breaks the regularity [of the museum] and makes the space more accidental which instigates the users to discover their own space within.” The structure is set close enough to the harbor so that its reflection is cast into the water, further blurring the boundaries of the void that encapsulates the museum. A harbor is by its very nature a place for ships, so it makes sense that Brininstool + Lynch’s massive design for the Guggenheim resembles a ship’s hull. The visual connection “symbolizes an important civic presence with an inviting nature for public use.” The sheer size of the proposal also draws parallel to a cathedral, a kind of sacristy to holdFinland’s artistic relics. The building is covered in a skin of precast panels inlaid with clay bricks. This not only gives a unique textural look to the exterior, but also references Nordic masonry. The interior mimics this pattern using stacked wood paneling. The generous 3,000 square meters of gallery space includes movable partitions, and is accompanied by an additional 3,500 square meters for displays throughout the building. The entire project is set upon a plinth that doubles as park and exhibition space, and allows the building to loom regally over the harbor. The galleries of New Office Works’ proposal are the primary space-makers of the building. Exhibition space takes the form of five concrete boxes embedded in a delicate wooden frame. Along the harbor, the boxes extend outward, providing shade for art displays and for walking pedestrians. Facing the street, they align more closely with the wall of the grid, mirroring the flat topography of the existing street facades. The largest of the five boxes is located on the north end of the site, marking the building entrance. Galleries are connected by a three story promenade that acts both as lobby and central exhibition hall. Programmatic spaces such as ticketing, storage, and offices are positioned along the perimeter of the building. On the second floor, this arrangement is flipped, with gallery space occupying the center of the building’s mass, and circulation relegated to the periphery of the floor plan. The galleries have alternating views of the harbor, and many have views into the lobby concourse below them. Seeking to fuse the rigorous grid structure of the city with the streamlined aesthetic of a cruise ship, this proposal by Guida Moseley Brown Architects is a sculptural form that provides large, open galleries for the display of numerous types of exhibitions. This Guggenheim submission is composed of four rectilinear volumes each with a distinct appearance and function. The entrance of the lobby is walled in glass, providing a welcoming and inviting atmosphere that also gives visitors a wide-angle view of the harbor. The gallery spaces are held in the largest, stainless steel clad volume. This is oriented parallel to the harbor. Much like Mies Van der Rohe’s New National Gallery, this gallery space is completely open, free to be partitioned as curators see fit. The roof of the galleries acts as a sculpture garden, and is accessed via the third glass volume, which holds special exhibitions. Crowning the building is a three story multi-purpose room that is aligned with Helsinki’s current city block grid. All four volumes are accessed via a central core which holds a grand staircase and an elevator. The strength of Leandro V. Locsin and Partners’ design comes from its simplicity. This Guggenheim proposal makes a conscious effort to “reconnect the park to the waterfront; to highlight this condition and give it back to the people.” The site has been transformed into a swath of parkland, molded into a plinth on which the building sits. Rising out of the southern end of the site, the museum is a single, swooping volume that turns its concave side to the harbor. The glass exterior walls are double-glazed for insulation, and have an operable clerestory level that allows for natural ventilation. The eaves of the roof provide shade to these windows in the summer months when solar heat gain is undesirable. Inside, gallery space is contained within a separate volume, protecting the art displays from direct sunlight. With this in mind, the architects have created a striking combination of planes and walls that imply both movement and impermanence. Running parallel to the harbor, the museum’s exterior is distinct for its rippling western façade, paneled with wood, and its glass, harbor façade. Gallery space within the museum is nestled against the building’s protective western edge, while the lobby, which runs the length of the building, is fully exposed to views of the harbor. The ground floor is occupied by museum functions such as a gift shop and restaurant, while the upper floors are devoted entirely to the display of art. This proposal by Bigoni Mortemard camouflages itself on site as a part of the landscape. Mimicking the rolling hillside of Tähtitorninvuoren park, the program of the museum is located below an undulating roof that visitors can walk on an across. At its summit, visitors can look out across the harbor and view the outdoor sculpture garden planted there. The park also includes an ice-skating rink and a restaurant in a glass dome that, at night, becomes a beacon of light. The building can be entered from both the street and the wharf. On the latter, the landscaped appearance of the museum is replaced by a long, rectangular glass façade. This wall is protected from direct sunlight by a screen of thin blades which gives it an ever-changing appearance from different perspectives. Inside, visitors are ushered into a massive lobby space that holds a number of surprises, such as a fireplace lounge and a bay window that looks out onto the park. The glass curtain wall looking out onto the water precedes the entrance to the massive, and extremely malleable, gallery spaces. The proposal submitted by Derek Pirozzi Architecture Workshop LLC appears at first glance to be a piece of driftwood washed up on shore. Indeed, the structure of the museum is inspired by the growth whorls of wood, a construction material favored throughoutFinland. It is comprised of six oval-shaped spaces that intersect to allow passage through them, each a kind of knot in the museum’s grain. Taking the place of a central knot is the museum’s performance hall, a three story sphere of a room from which all other programmatic spaces radiate. This program includes a sculpture courtyard through which visitors pass to enter the museum. What makes this proposal especially unique is the flexible wall system that partitions the museum’s galleries. Held fast by slots in both the floor and ceiling, the partitions are capable of bending and curving into almost any position. This gives curators new options in terms of how to display art, and ties the gallery forms back to the sinuous appearance of the museum exterior. Much of this museum is housed in a concrete shell beneath the plaza that covers much of the site. While the decision to put the museum beneath a plaza is a recurring one in many of the Guggenheim submissions, 5468796 (in partnership with Jae-Sung Chon) has given theirs a unique character. The surface of the plaza has a series of dips and depressions that become reflecting pools when it rains. These pools create a visual extension of the harbor water, and create exterior rooms through which visitors must navigate through. Rectangular courtyards cut through the plaza, ensuring that daylight is provided throughout the building. Most of the gallery space in this design is on one floor, and is of a single height. The exception is the exhibition space beneath the stacked-timber form that soars over the site. This vertical space has a movable floor, allowing the room to accommodate anything from seminars to concerts based on the floor’s position. The beams used in the construction of the walls are thick enough and spaced just far enough apart to illuminate the space with soft, indirect light. The height of the hall also creates a stack effect that cools the museum. The entire building could potentially qualify for LEED Gold certification. LOHA’s Guggenheim proposal bases its approach on the precious nature of light in Finnish culture. Their design, a cube with five floors connected by a central atrium, uses reflective materials and solar panels to make the museum a bright, warm, and welcoming place. The atrium, contrary to the rigid geometry of the rest of the building, is a sinuous space constructed of birch timber. This construction punctures the building skin at strategic points to provide light and scenic views to the atrium. The gallery spaces are located on the upper floors of the museum and are designed as “trays.” The walls and floors of the rooms are solid, while the ceiling is glass to provide indirect lighting from the clerestory windows between floors. The rooftop harbors a sculpture garden and greenhouse, both of which are set against panoramic views of the Helsinkiskyline. The entirety of the museum design is so compact that much of the site can be given over to park and plaza space. The performance hall and conference center manifest themselves as a pavilion in this space, ensuring circulation in this outdoor area. This proposal from BAT (Bilbao Architecture Team) took inspiration from Finland’s winter ice floes in designing their Guggenheim. The fractured paneling of the roof is meant to be seen as a natural extension of the harbor during the winter. During the summer months, the melting snow exposes greenery taken from Tähtitorninvuoren Park planted on the roof. This roof is structurally supported along its perimeter, allowing for more open spaces on the interior. Visitors enter from the city via a ramp, which mounts the plinth on which the museum sits. Many of the service spaces and archival rooms are located in this plinth, giving them better access to the street. The museum proper is organized centrally around an atrium. Public spaces such as dining are located in the southern part of the museum for greater sun exposure, while galleries are placed in the more sheltered northern half of the building. Synthesis’s design for the Helsinki Guggenheim manifests itself as an object hovering low over the site. The ground floor is entirely devoted to public space such as shops and dining, while the upper floors hold the galleries, classrooms, and auditoriums of the museum. These halves are connected by a central atrium that will also host community events and exhibitions. This atrium is the focal point of the museum’s organization—the architects describe their scheme as “an interlocking pinwheel diagram which torques around the atrium in a clock-wise direction. This warping 3D diagram drives the entire design concept, as the building circulation, programmatic organization, and structure all begin with this diagram of three interlocking reciprocal structures.” This layout is emphasized by the lines of the timber formwork used for the building’s structure. This kind of striation plays a part in the building façade as well. The museum’s concrete rainscreen takes inspiration from the knit pattern of a Finnish sweater, creating a geometry of lines that also acts as sun protection for the building’s southern-facing sides. Lighting control is one of the many design decisions that contributes to the museum’s sustainability. The building’s orientation and shape are also ideal for solar heat gain, and for rainwater drainage. XTEN Architecture’s design makes the museum’s footbridge to the park a main feature of the museum. Fully planted, the bridge divides the building in two, transforming into a sprawling park upon reaching the site. Much of the museum’s program is huddled against the western edge of the site, creating a community gathering space along the water that is largely protected from the roadway. This sense of protection is enforced by the mountainous appearance of the building’s exterior. Upon entering, visitors find that these “mountains” are actually skylight cones. Outfitted with custom louvers, the cones bounce light onto the whitewashed gallery walls below. These ensure an abundance of diffuse, natural daylight, and a decreased dependence on electrical lighting. As one can imagine, most of the exhibition space is located under these formations, while service spaces are located on the ground floor. The dining areas and concert hall of the museum occupies the southernmost bend of the building, taking advantage of the harbor views while providing a buffer between the harbor docks and the museum plaza. Much of the interior is constructed and finished in timber, as is traditional in Finnish architecture. The design also takes into account many sustainable design alternatives, such as passive heating and cooling strategies, and rainwater collection. The stone façade of the building is outfitted to absorb solar heat and release it into the building at night. One of the few submissions that breaches the site boundaries, this proposal by Tammo Prinz Architects extends into the harbor, creating a marina as well as a multi-use plaza sunken into the water. The museum’s design was inspired by the many islands of Finland, particularly Valkosaari, which lies directly in front of the harbor. The museum’s shape is constructed from a series of stacked spirals. These spirals are split and offset from each other, creating a dynamic appearance while maintaining a clear route of circulation from the interior. This circulation starts in the lobby, the base for the building’s central core. This space has grand views of the harbor, and a mezzanine floor that allows visitors to preview the exhibition space before entering it. Each floor of the museum has gallery space as well as support rooms to blur the boundary between public and private space. The design includes a gallery floor entirely walled in glass for special exhibitions. Asymptote aims for their Guggenheim proposal to be the “new open urban living room for Helsinki.” The site will host a plaza for outdoor performances, exhibition space along the harbor, and a skating rink and skateboarding park at its southern end. The museum is connected to the adjacent park via an underground pedestrian passage. The ground floor holds the museum’s Guggenheim Grand hall, and is accessed from the harbor-side promenade. Visitors will begin their journey through the building from a central atrium, walled in glass, which gives uninterrupted views of the surrounding water and city. From this space, they can access a number of galleries, ‘media rooms’ and service spaces. An homage to Finland’s maritime tradition, the structure of Arkipelago will be a curvilinear steel and timber frame, similar to a ship’s hull. Prefabrication will play a large role in the construction process—many of the timber wall and roof elements will be cut using a CNC laser offsite. This will ensure speedier assembly and greater productivity, especially during the winter.